“Fantastic from the first survey to the final plastering. 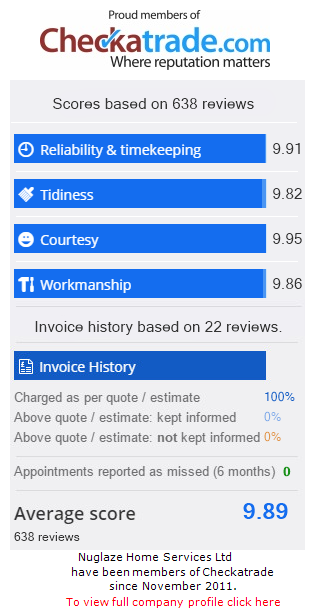 Good, knowledgeable, courteous, skilled team who were flexible in terms of our needs, and supplied us with a product we're really happy with at a very reasonable price. We highly recommend! "New front and back doors - Very prompt arrival. Very courteous professional workmen, couldn't fault their work and cleanliness at all. Both areas were left cleaner than when they arrived!!" "I wanted to take the opportunity to write and tell you how happy we are with the work on our house. The whole experience has run very smoothly and stress-free and we really love the end results. Steve has been a brilliant project manager and always very helpful and thorough throughout the works - he planned everything so well so all works went to schedule and if there were any queries or issues he resolved them quickly without fuss. The Virtuoso team's input has been fantastic. The oak gables are a wonderful feature and have helped to give the extension a 'wow' factor. The oak porch is also a lovely new feature for the front of the house. Mick and the NuGlaze team have also been great and we are very pleased with all of the new glazing especially the bifolds. Adam has been very helpful and all of your contractors have been courteous and friendly. For this building experience to be so positive and for the work to be done in a relatively short timeframe has been extremely beneficial to us especially as we have been living in the house throughout it all. I would highly recommend your team and hope to have the opportunity to use you again sometime." "I just wanted to pass on our thanks for all the work the Duaris team did at Rocks Cottage. You, the team and the quality of work have been first class. Jules is even missing the team that had been so helpful and focused on doing a great job! Rest assured we will be a strong advocate of Duaris when asked by friends and family."